Lovely 2 bedroom apartment with access to beautiful grounds. Great place for fishing. Private access to Waiteti trout fishing stream, and only 100 metres to Lake Rotorua. No sulphur smells. Access to a shared boat jetty. The use of two kayaks and an aluminium dingy with life jackets. The spa pool and BBQ is available for our guests use. 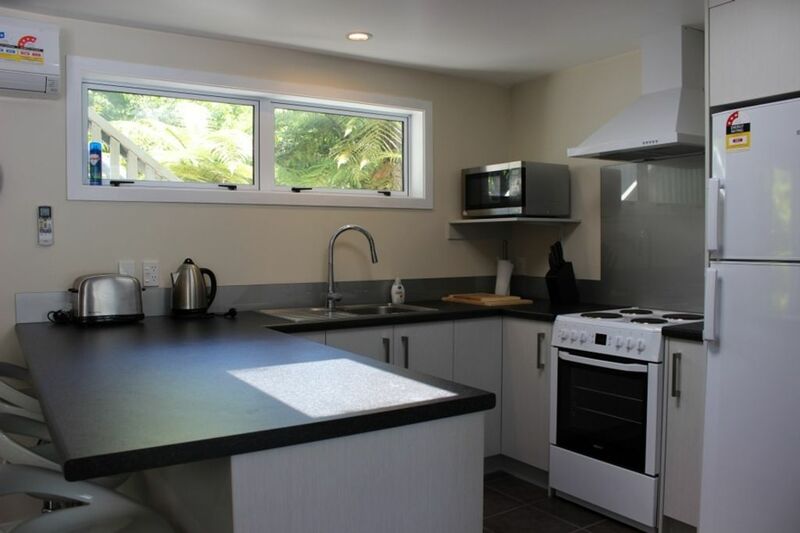 The apartment has gas hot water, heat pump/AC and a fully equipped kitchen. It has a large TV that hangs on the wall, with Sky TV connected. Laundry facilities are available. Owners live on site with their own entry. We are happy to help make your stay as enjoyable as possible. Close to all the famous Rotorua attractions such as Agrodome, Ogo/Zorb, Mitai Maori Cultural Experience, Skyline (Luge), Te Puia, Whakarewarewa and more. The Paradise flat was clean, tidy, comfortable and well equipped. It was in a good quiet location and Pani was a friendly host. We enjoyed a relaxing break here. Well planned apartment suite with all mod cons. Pani’s place was really comfortable & it was great to be minutes from all the sites in Rotorua without the congestion of tour groups. The suite was beautifully appointed with great water pressure & all the conveniences of home. Ideal based for our trip to Rotorua. The property had everything we needed, plus the benefit of a hot tub to relax in. Nice and clean and comfortable. Nice little property ideal for short breakaways. Located next to a lovely stream close to the lake. Good fly fishing in the area. Enjoyed our stay.